Michael Corrente, Rhode Island born and raised film director and producer, will be a guest at the 8th annual Benefit Earth Bash on Friday, September 20th at Southwick’s Zoo. Michael is a longtime fan of Southwick’s Zoo and a big supporter of Earth Limited’s mission. He is excited to attend the event, meet guests, and he will be bringing with him a donation from his friends the Farrelly Brothers, Bobby and Peter, Rhode Island natives and great zoo supporters as well. They have donated a “Day on the Film Set” of their upcoming film, Dumb & Dumber II, in Atlanta, Georgia, starring Jim Carrey and Jeff Daniels. Michael is an actor, producer, and director with a long history of film making, not only in Rhode Island but also around the world. This Rhode Island native got his start at Trinity Rep and is famous for his work on independent film production. The event committee is thrilled to have him join us for this special fundraising event. 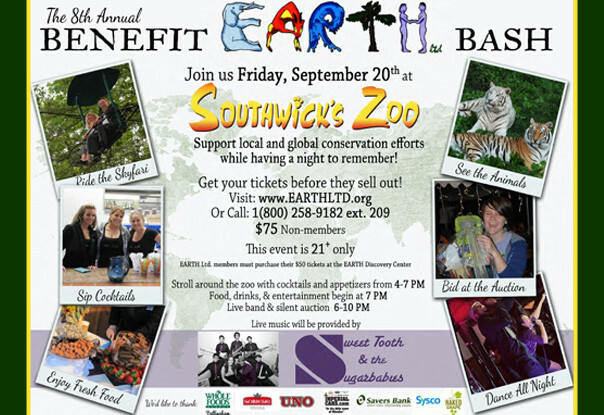 Proceeds from this event will go toward the completion of The Earth Conservation Center at Southwick’s Zoo. Visit http://www.earthltd.org/ to learn more about how you can purchase tickets to the Benefit EARTH Bash. EARTH (Environmental Awareness of Resources and Threatened Habitats) Limited is a grassroots, non-profit educational organization located at Southwick’s Zoo in Mendon, MA. To learn more about how you can support EARTH Ltd., please visit them online at EARTHltd.com, facebook.com/EARTHLimited, or in person at the EARTH Discovery Center inside Southwick’s Zoo.